Sooooo, you want to Pumpkin All The Things but you took a pledge to ban the cans? I got you covered. And really, it’s simple. Turning a pumpkin into a pumpkin flavored treat is really easy, just takes a bit of time. But you can totally do this, and your unprocessed life will soon be filled with pumpkin scones, pumpkin pie, pumpkin cookies, pumpkin soup, and pumpkin toothpaste (oh wait…). First, lets talk about the pumpkins. What pumpkins can be used? 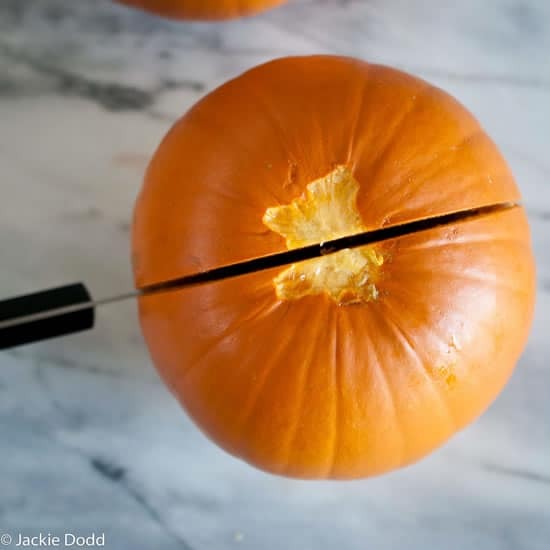 Can you make pie out of those Jack-O-Lantern pumpkins you buy your kids at the grocery store? What is a pie pumpkin? Jack-O-Lantern pumpkins have been bred for decades for qualities that have nothing to do with taste. Although still technically edible, the flavors are not taken into account when breeding. Jack-O-Lantern pumpkins are now bred for thick skin that can hold up to carving, as well as a heartiness to survive after being carved, and set outside with a candle stuck in its guts. Look for a pie pumpkin, most commonly called a Sugar Pie Pumpkin. They’re small, about the size of a cantaloupe. If you’re confused, jut ask your grocer. 1. Preheat oven to 375° F.
2. Remove the stem by running a butter knife around the edges and then prying it off. 3. 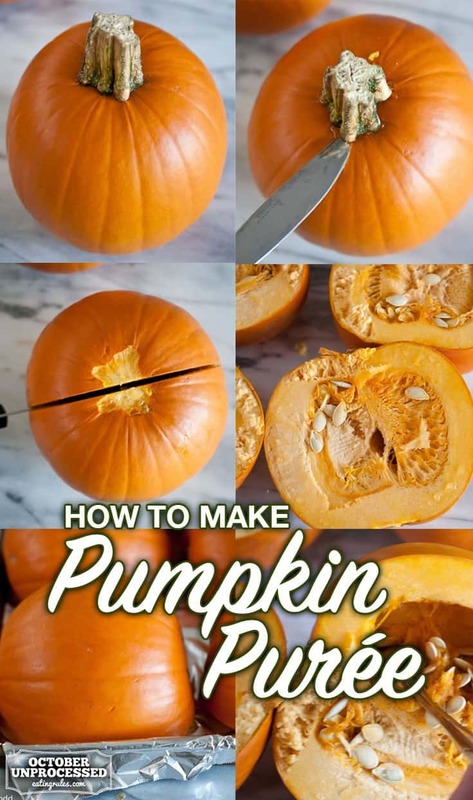 Cut the pumpkin in half, right through the hole left by the stem. 4. Scoop the seeds out with a spoon. 5. Line a baking sheet with aluminum foil. 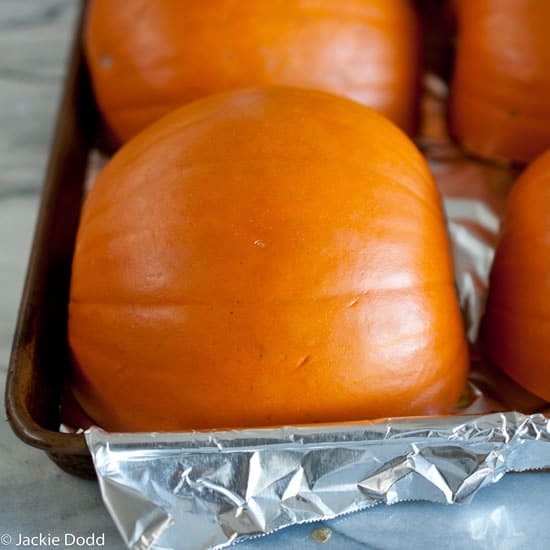 Place pumpkins on baking sheets, cover tightly with aluminum foil. Roast at 375° for 1 to 1 1/2 hours, or until a fork can easily slide into the skin. 6. Allow to cool and scoop the flesh out. 7. Add to a food processor and purée until smooth. 8. Store in an air-tight container. Pumpkin purée also freezes well. 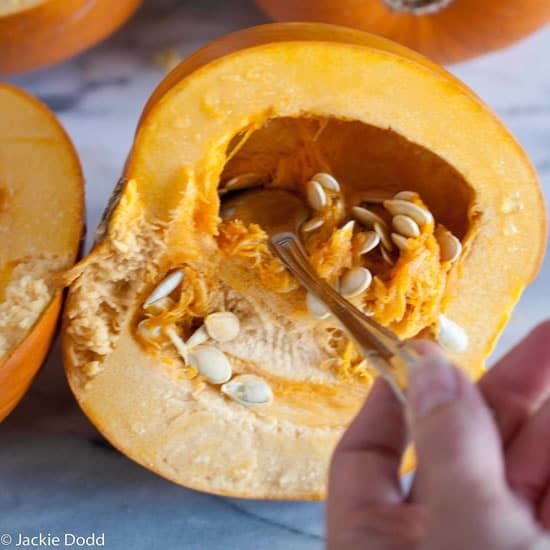 Although you technically can use a "jack-o-lantern" pumpkin, it won't taste nearly as good. 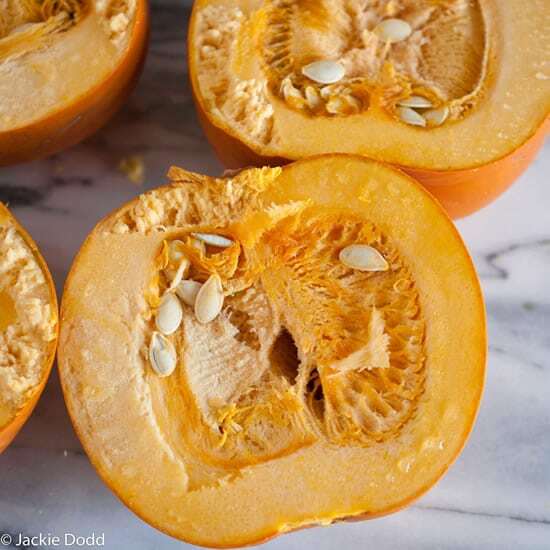 Best to use a pie pumpkin, also called a Sugar Pie Pumpkin. Remove the stem by running a butter knife around the edges and then prying it off. 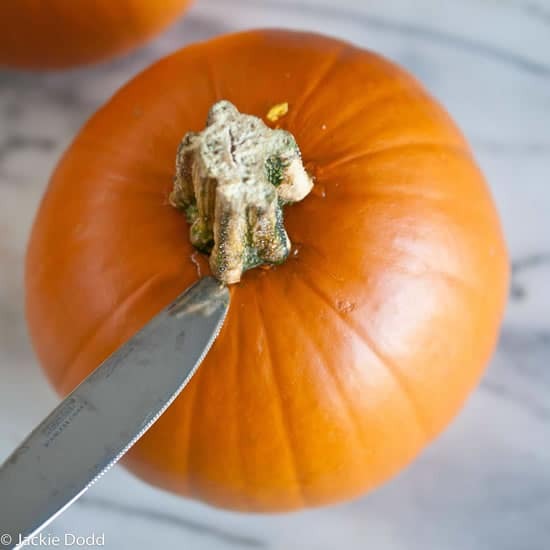 Cut the pumpkin in half, right through the hole left by the stem. Scoop the seeds out with a spoon. Line a baking sheet with aluminum foil. Place pumpkins on baking sheets, cover tightly with aluminum foil. Roast at 375° for 1 to 1 1/2 hours, or until a fork can easily slide into the skin. Allow to cool and scoop the flesh out. Add to a food processor and purée until smooth. Store in an air-tight container in the refrigerator. Pumpkin purée also freezes well. Jackie Dodd’s beer-infused recipes earned her a spot as a finalist for Saveur Magazines Best Original Recipes, 2014 as well as crowned winner for Best Beer Coverage in 2015 (yes, craft beer is unprocessed). The Beeroness was also a finalist for Better Homes and Gardens Best Food Blogs, 2015. She has been seen on The Today Show, Lifetime Network, CBS News, as well as interviewed in print publications such as Imbibe, Bite and The San Francisco Chronicle. She also writes for Parade Magazine, Draft Magazine and Whisk Magazine. 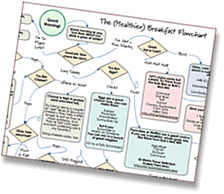 Jackie is the author of The Craft Beer Cookbook and The Craft Beer Bites Cookbook, and you can connect with her on Twitter, Facebook, and Pinterest. You may also want to let some of the excess moisture drip out of it first for super thick pumpkin like the kind that comes in the can. Line a strainer with cheese cloth or paper coffee filters, place over a dish to catch the juice, place the pumpkin on the cheese cloth or filters and let sit in the fridge overnight. And you can add the excess juice to your next pot of soup for extra flavor and nutrients! I absolutely LOVE making my own pumpkin puree. Unfortunately, the stores always sell out of them before I get a chance to buy them. So this year I tried planting my own, and successfully ended up with three pie pumpkins and I am so excited because I actually grew them myself! Anyway, I was going to say that I find that it takes a lot of muscle to scoop out the seeds before cooking it, not to mention a bent up spoon. 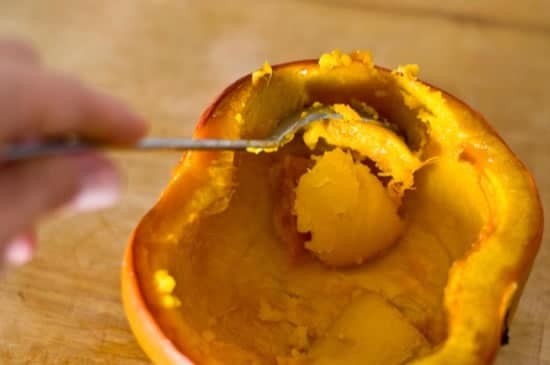 So I prefer to cut the pumpkin in half and cook it just the way it is, and then the insides scoop out way way easier after it has been cooked. And I do save the seeds for yummy roasted snacks. A sturdy ice cream scoop did the trick for me recently when scooping seeds. There is an easier way yet. Take the stem off – or not. Cut in half width wise rather than vertically. Scoop seeds out. Put the halves back together. To the rest the same or put through a food mill/sieve. You can get twice the pumpkin in the oven this way. I have 28 pumpkins to roast, so discovered this works much better! You cannot can/bottle puree’. There has been no safe way researched for home canners. You can bottle cubed, but not puree’d. Just FYI. This is another addition to my recipes for this coming Thanksgiving weekend (in Canada). Canadians deserve extra pat in the back for surviving Thanksgiving and Halloween when completing October Unprocessed! !